Three landscapers go from lawns to lanes, forging new ground in the $1 billion business of parking lot striping. 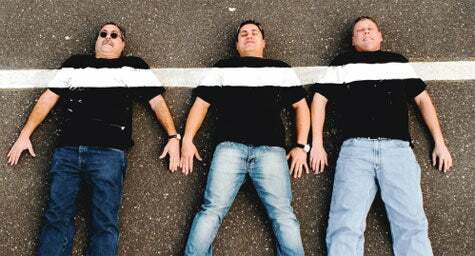 Striped: from left, Daniel Rella, Chris Couri and Tom Darrow. There are roughly 50 million parking spaces in the United States, and by law many of them have to get a fresh coat of reflective paint every year or two. You would think re-striping would be easy, but back in 2008, Chris Couri, Daniel Rella and Tom Darrow, who all owned landscaping businesses around Richfield, Conn., found themselves in a bind. "Danny called around to 13 guys to stripe our parking lot, and only two called back," says Couri, CEO of We Do Lines. "We realized the parking lot striping industry was underdeveloped, and didn't have any real standards." In fact, it was a $1 billion industry with no national players. That's what led the three men to buy a striping machine, set up a website and phone line and see what happened. The calls started coming in, and soon the three were staying up nights striping parking lots in Hartford and New Haven and spending winters striping lots for resorts in Florida. In 2009, they hired Skip Barrett, co-founder of the custom garage-organization system GarageTek, to help them franchise their idea. We Do Lines now has 15 franchises in Connecticut, New York, the Carolinas, Florida and Ohio, with plans for 20 more in 2011 and ambitions for 100 new units over the next five years. We caught up with Couri to read between the lines of his success. Why did you choose franchising? The truth of the matter is we didn't think about franchising at first. After going through our first year of business and making so much money on a part-time basis, we started thinking about expansion. [Their smallest job is usually $400 for 100 lines but differs according to geography.] I'd studied franchising at Babson College and always thought it was an interesting method of growth. So an attorney friend connected us with a guy who sold franchise concepts. He helped us make it to the [Franchise Disclosure Document] stage. Can you really compete against cut-rate, part-time stripers? We're very competitive with other stripers, but we have advantages. Our striping helps optimize parking flows, and we make parking lots a lot safer. There are not a lot of companies that can serve large organizations or multi-unit owners doing something as mundane as parking lot striping. Instead of using three or four vendors in different states, they just come to us, and they like that. Is it hard to stripe a lot? We use the Graco LineLazer IV 3900. It's a state-of-the-art, 3300-psi air sprayer, so the lines are crisp and not wavy. You just walk behind it, like a commercial mower, but it's much more highly engineered. We had no idea about how to do any of this until we bought the machine. It will paint a straight line as long as you lock in the front wheel and as long as your legs are the same size. I broke my femur awhile ago, so my left leg is short -- so my lines turn. Your company name is a bit controversial. Who came up with it? Guilty. We were just kicking around ideas, and we said we really need a name that's edgy to get us out there. I said, "I've got it, We Do Lines," and I was pretty much kidding. Dan and Tom looked at each other and said, "That's it! It's funny, it draws attention, and people don't forget the name." Franchisees say the name is a critical piece of the business. Our client list runs the gamut, and they've all found it creative. So far.